The mysterious folk magic of the Pennsylvania Dutch and their neighbors goes by many names: Pow-wow, Braucheri, Hexerei, “trying,” etc. Depending on who you talk to, it may be an extension of Christian prayer or faith healing, a blend of medieval Cabbala and German folk magic, an inherited family practice, a learned set of techniques, an entirely holy healing tradition, or gray-area almost-diabolical sorcery. There are a range of individual methods to Pow-wow, including written talismans, spoken charms, herbal remedies, and calculated hand-movements. And I’m not even going to touch the controversial concept of hex-signs on barns yet. In this series of posts (which will probably go up over the course of the next few days), I want to provide a little bit of background on this rich and interesting magical system, with a few little charms and techniques to try for yourself. I won’t be getting into great detail yet, as this is a system which many claim takes a lifetime to fully master, but I will be presenting a bit of the lore associated with Pow-wow and pointing you in the direction of a few really solid resources on the subject. Where does Pow-wow come from? Bilardi goes on to point out that many Old World central and northern European cultures migrated here under the German banner, including those from modern-day Poland, Holland, and Scandinavia. Still, many of these peoples had certain cultural commonalities. When they came to America, many of these Germanic immigrants pursued unorthodox religious or spiritual paths. Bilardi refers to two distinct groups of Pennsylvania Germans, the “Plain Dutch” and the “Church Dutch” (‘Dutch’ here being a corruption of the word deustche, the word for the German language). There was strong religious diversity in the New World, including groups like the Moravians, the Brethren, the Anabaptists (now the Mennonites and the Amish), the Schwenkfelders, and the Lutherans. “German-language almanacs were widely distributed on the eighteenth-century frontier. This held secure a distinct occult-centered cosmology in the minds of early German pioneers that went hand in hand with other occult curing and healing methodologies” (p. 32). The proliferation of these magical pamphlets and almanacs spread the central ideas of what would become known as Pow-wow around the north-central Atlantic coast, the Appalachian mountains, and inland into the frontier-lands. 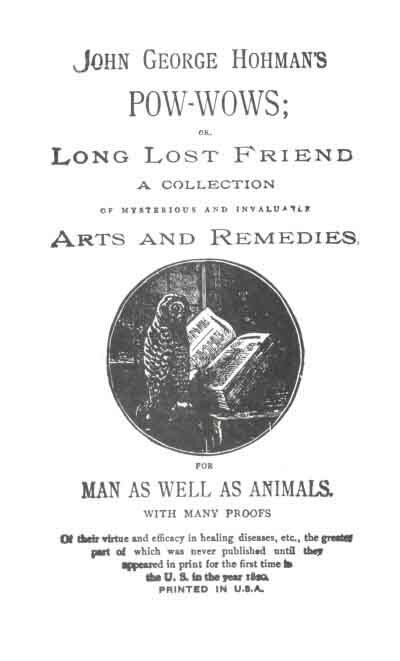 One such almanac was the famous Long Lost Friend, by John George Hohman, which outlined many of the practices still used today. I’ll have some of the charms from this book to try out a little later in the series, but for now it’s enough to know that by 1820 (the date of Hohman’s publication), this form of magic had taken on a distinctly American flavor and had become a key part of the Pennsylvania-Dutch cultural landscape. Okay, that’s it for today. I’ve got more coming on this topic, so be on the lookout for additional posts this week! This entry was posted on February 16, 2010 at 11:09 am and is filed under History & Lore. You can subscribe via RSS 2.0 feed to this post's comments. Have you ever considered writing a book? I’ve been reasearching writing a book on North American Witchcraft Traditions and how people adapt other Trads into a North American practice, for the last year and have recently just srated writing. Of course so far I have lots of Hedgewitchery, Green/Kitchen/Cottage/Wild witchcraft (and others such as Feri) but not so much on Pow Wow and Hoodoo etc … We should collaborate!